The Cast Of 'The Band's Visit' On What Makes The Broadway Smash Relatable The first Broadway show to grace NPR's Tiny Desk Concert series, The Band's Visit is nominated for 11 Tony Awards. Stars Tony Shalhoub and Katrina Lenk sat down with Ari Shapiro after the performance. 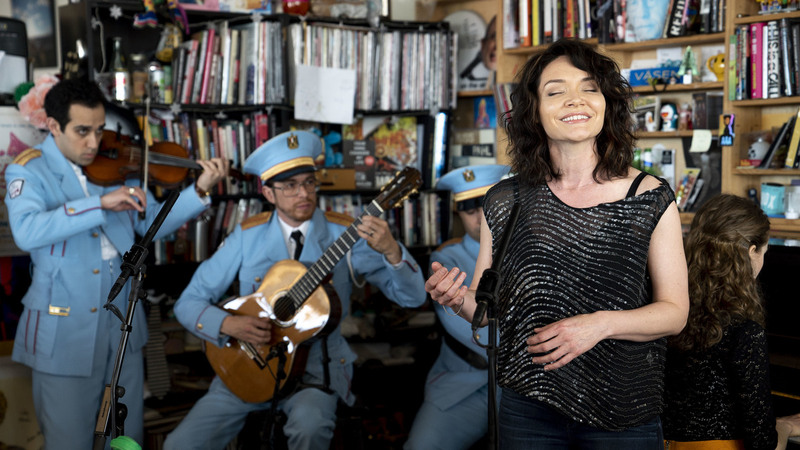 The Band's Visit star Katrina Lenk performs at NPR's Tiny Desk on May 15, 2018. Tony Shalhoub and Katrina Lenk play the show's leads, bandleader Tewfiq and cafe owner Dina; both are nominated in acting categories. When the cast stopped by NPR's Tiny Desk this spring to perform selections from The Band's Visit, Shalhoub and Lenk sat down afterwards to chat with All Things Considered host Ari Shapiro. "It's kind of a respite for all of the noise and strife out there. It's kind of the perfect antidote, really, nowadays, for all the madness," Shalhoub says of the show's plot, noting that the story focuses on people more than politics. "It's about people taking risks, reaching out toward each other, trying to communicate and coming together over the common love of music." This show lacks the bells and whistles of typical Broadway hit. Lenk says its intimacy is what makes the show stand out. "I think the characters that are in the show are immediately relatable. Yes, they're not in America, but there's 'that guy' and everyone knows 'that guy.' ... They've been that person at some point in their lives," she says. "I think everyone can relate to the characters and also bring their own experiences to the show and take back what it means to them personally." Hear more of the conversation at the audio link — and watch the full performance in NPR's Tiny Desk series. Audio engineer Josh Rogosin contributed to this story.